Could There Ever Be A Worldwide Beer Shortage? With all this talk lately about an impending pork shortage (though it’s emphasized as a “bacon shortage” to get people’s attention – which really seems to work! ), it got me thinking, could there ever be a Worldwide beer shortage? I sure hope not, but let’s take a look. The pork shortage, we’re told, is looming due to the rising cost of pig feed due to “the global failure of maize and soya harvests.” This has led to a decline, Worldwide, in pig herds which, in turn, leads to higher pork prices for consumers. In fact, the price of pork has doubled in the U.S. since 2006 and it’s expected to climb even higher as the pork shortage worsens. Everything, it seems, has its ‘accessories’. Wherever there’s a successful market out there for any product, there are always inventive people trying to capitalize on that success by making a product to accompany it. The prime example we see today is probably iPad/iPhone accessories. With such a large market and, literally, millions of fans eagerly waiting in line to buy the next version each time it comes out, entire businesses have been launched and become successful simply by making gadgets and accessories for these wildly popular products. But what about beer? 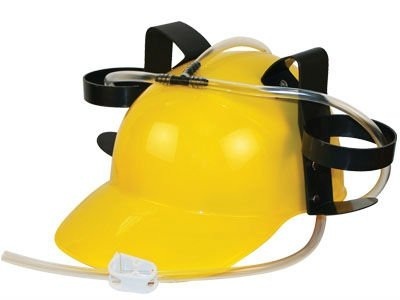 Has craft beer become so popular that companies can do well capitalizing on making beer gadgets/accessories for the masses? Apparently so. Here are a few different beer gadgets/accessories that have appeared to satisfy our urge to accessorize our favorite indulgence: craft beer. 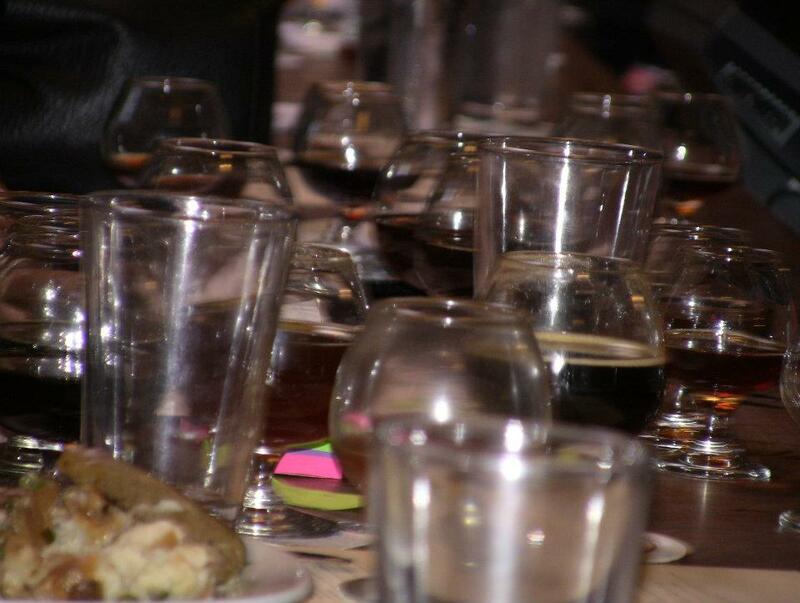 What Makes A Good Craft Beer Bar? Choice is important. In fact, other than quality, choice and variety are close to the top of the list when discussing what sets craft beer apart from the mass-produced stuff we constantly see from Bud, Miller, Coors, etc. Craft beer means choice, and there are quite a few great craft beers across this nation (and internationally) to choose from. However, is choice the most important factor in determining which craft beer bar is the best? That can depend on a few different factors. Super Deli Mart, the best little mini-mart around, truly appreciates their customers. This past Sunday, 9/16 they showed that appreciation during their end of Summer customer appreciation BBQ. From noon to 5:00PM this past Sunday, they had free hot dogs, BBQ corn, chips, sodas and bottled water for everyone. 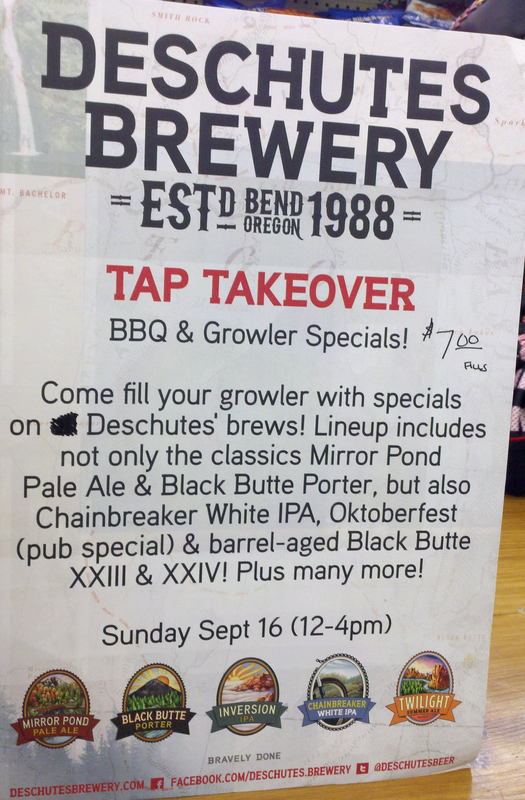 Also, of course, great deals on 12oz pours and growler fills of some great beers from Deschutes Brewing. 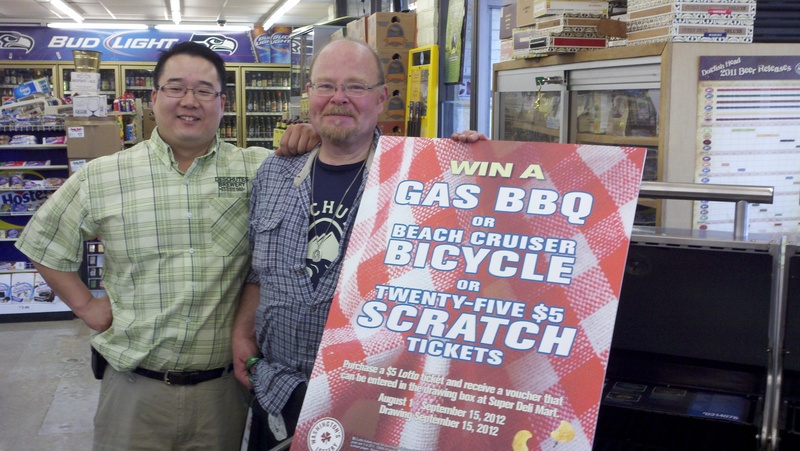 There were also chances to win a $500 BBQ Grill, a $300 Cruiser style bicycle, as well as Deschutes growlers, T-Shirts, Hats and pint glasses. If you follow Super Deli Mart on Twitter, you know that they go through a ridiculous number of kegs each week. That’s pretty easy to do when you offer regular prices of $3.75 pours (usually pints, but occasionally growlers of the more ‘high octane’ stuff) and $10 growler fills. Add to that a huge cigar selection, a great wine selection, including champagne, and bottle choices that come close to rivaling some of the better bottle shops in the area and it’s easy to see why Super Deli Mart has such a following. During the BBQ Super Deli’s regular prices got even better. It was a Deschutes tap takeover, with $3, 12oz pours of beers like The Abyss 2011, Black Butte XXIII, Black Butte XIV, Hop In The Dark CDA, Obsidian Stout, Mirror Pond Pale Ale, Green Lake Organic Ale and more. Growler fill prices were only $7 for a fill (with some of the more coveted items, such as Black Butte XXIII costing $10 a fill). Super Deli Mart owner, Min Chung, really knows how to keep his customers happy. The turnout for the BBQ was a bit lower than expected, but that might have had something to do with the fact that the Seahawks’ home opening game was happing around the same time. Nobody seemed to mind, though. It just meant a less crowded beer garden and more great beers for those of us that were there. I had a great time and came home with a growler of Black Butte XXIII as well as a growler of Hop In The Dark CDA. Not a bad haul for only $17. If you’ve never been to Super Deli Mart, do yourself a favor and get over to West Seattle to check them out. It’s worth the trip. Some fans at the BBQ had come from as far away as Kirkland and North Seattle just to visit the greatest little mini-mart around. Flying Bike is Seattle’s first cooperative brewery, and only the second cooperative brewery in the nation besides Black Star out of Austin, Texas. Flying Bike offers it’s members the chance to be a brewery owner and be an integral part of the ever growing craft beer scene in and around Seattle. The cooperative currently has approximately 550 members, and continues to grow. Flying Bike’s goal is to reach 1000 – 1200 members as soon as possible, at which time they should have the necessary funds to secure a location and actually launch the physical brewery. Until that time comes, Flying Bike plans to continue holding member homebrew competitions, and then having the winning beer from each competition scaled up and brewed by a local craft brewery. 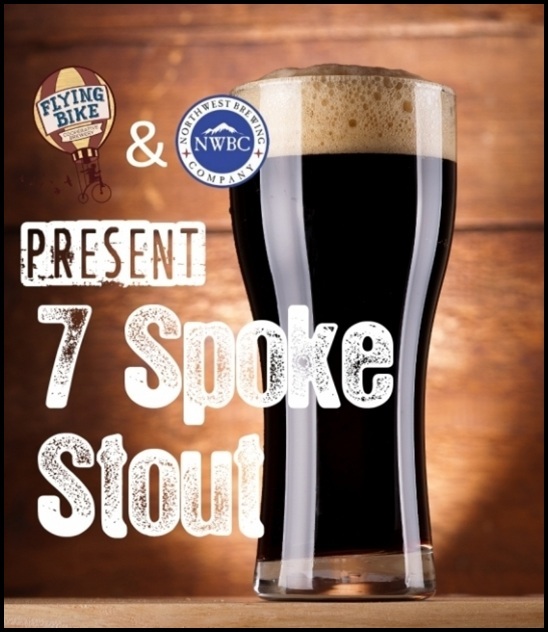 Their latest beer, dubbed 7 Spoke Stout, was brewed by Flying Bike Coop member and homebrew competition winner, David Flynn, and then scaled up to a 15 barrel batch by their newest brewing partner, Northwest Brewing Company (formerly Trade Route Brewing) out of Pacific, Washington. 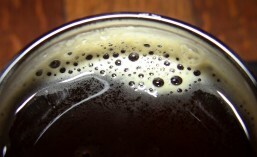 The first keg of 7 Spoke Stout went on tap at The Wurst Place – a sausage and beer bar on Westlake Avenue in Seattle – last week, and you should also be able to find it on tap soon at one of my favorite craft beer spots in Seattle, The Pine Box up on Capitol Hill.